Meanwhile, in 4-quart saucepan or Dutch oven, melt butter over low heat. Cook mushrooms and garlic in butter, stirring occasionally, until mushrooms are tender. Stir in flour, salt and pepper. Cook over medium heat, stirring constantly, until mixture is smooth and bubbly. Gradually stir in milk, sherry and broth until smooth. Heat to boiling, stirring constantly. Stir in Fontina cheese until melted; remove from heat. 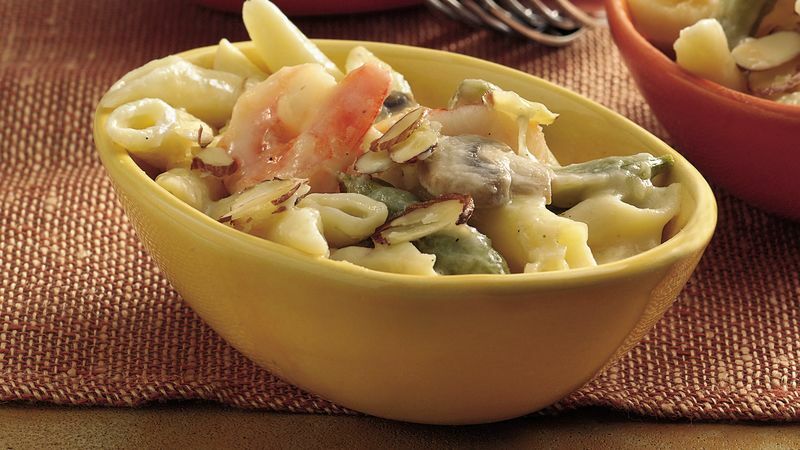 Stir pasta, shrimp and pea pods into mushroom mixture. Pour into baking dish. Sprinkle with Parmesan cheese and almonds. Bake uncovered 20 to 25 minutes or until cheese is golden brown. Sugar snap pea pods are a hybrid pea, crossing the English pea and the flat snow pea. Because they're primarily available in the spring and fall, frozen are used for convenience. Feel free to substitute fresh sugar snaps (cooked and drained) for frozen.